4 Bedroom Semi Detached House For Sale in Orpington for Offers in excess of £725,000. This four bedroom family home is presented in very good decorative order throughout and is situated in one of Orpington's finest roads and conveniently located within half a mile of the town centre and 0.75m of the main line station (c.16 minutes fast service to London). Furthermore, one of the country's finest grammar schools - St. Olaves - is located in the road. The accommodation is arranged over three floors and includes a modern fitted kitchen/breakfast room, double glazed conservatory and master bedroom with en suite. 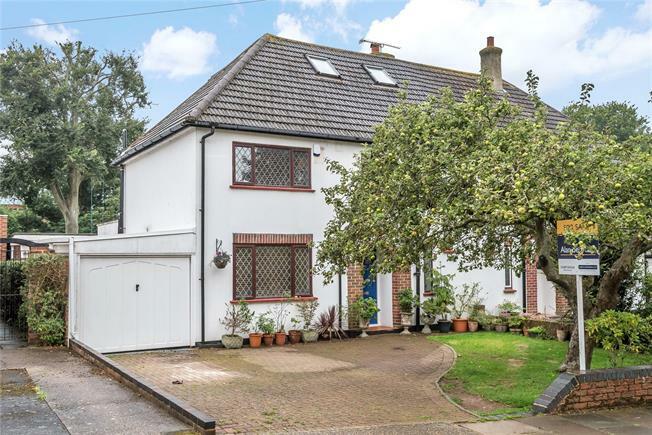 The property also benefits from a detached single garage and south facing rear garden. Entrance Hall Hardwood front door; frosted leaded light windows to front; single radiator; stairs to first floor; wood block flooring; understairs cupboard. Living Room 18'10" x 11'10" overall (5.74m x 3.6m overall). Double glazed sliding patio door to rear; double doors to dining room; feature fireplace with coal effect gas fire; two radiators; wood block flooring. Dining Room 13'7" x 10'6" (4.14m x 3.2m). Double glazed door and window to rear; opening through to conservatory; radiator; carpet as laid. Conservatory 10'8" x 8'5" (3.25m x 2.57m). UPVC double glazed conservatory with double doors to garden; radiator; carpet as laid. Kitchen / Breakfast Room An L-shaped room 19'10" (6.05m) x 12'9" (3.89m) overall. Double glazed leaded light window to front and side; double glazed door to side; an L-shaped room with a comprehensive range of wall and base units with roll top work surfaces; breakfast bar area; two designer radiators; 1 1/2 bowl sink unit with mixer tap; built-in oven and integrated gas hob with extractor over; plumbing for washing machine and dishwasher; space for fridge , freezer and tumble dryer; wall mounted gas boiler; ceramic floor tiles. Landing Built in airing cupboard housing hot water tank; carpet as laid; stairs to 2nd floor. Bedroom Two 12'10" (3.91m) x 11'10" (3.6m) overall - irregular in shape. Double glazed window to rear; radiator; carpet as laid. Bedroom Three 11'7" x 10'1" (3.53m x 3.07m). Double glazed window to rear; radiator; carpet as laid. Bedroom Four 9'3" x 8'7" (2.82m x 2.62m). Double glazed leaded light window to front; radiator; carpet as laid. Bathroom 10'7" x 4'7" (3.23m x 1.4m). Frosted double glazed leaded light window to front; suite comprising corner 'Whirlpool' bath with separately plumbed shower unit over; low-level WC and wash hand basin inset into vanity unit; radiator; shaver point; tiled floor. Master Bedroom 19'5" (5.92m) x 14' (4.27m) overall (irregular in shape). Three double glazed windows to rear and two skylights; radiator; laminate wood flooring; built-in dressing table; access to eaves. En Ssuite Shower Room Walk-in shower cubicle, low-level WC; wash hand basin inset into vanity unit; heated towel rail; access to eaves; vinyl floor tiles; extractor fan. Front Garden Block paved driveway provides off-street parking and leads to garage via double gates; area of lawn with apple tree. Rear Garden 85' x 34' (25.9m x 10.36m). Paved patio leads to covered seating area; remainder mainly laid to lawn with mature shrub beds. Detached Single Garage 20'8" x 9'2" (6.3m x 2.8m). Up and over door to front; door and window to side.